Background: Currently, how to measure the magnetic field accurately is a difficulty in the study of strong magnetic field. Methods: This paper summarizes several methods of measurement techniques for strong pulsed magnetic field presently, the principles and characteristics of various measurement methods are compared and analyzed. The maximum measurement intensity of electromagnetic induction method can reach 103T. 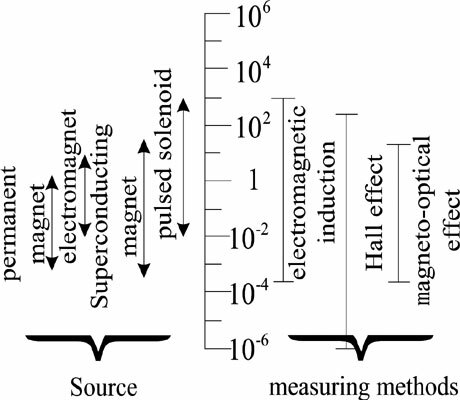 The magneto-optical effect method of Faraday can measure the magnetic field intensity of 0.1~10T, and the measurement error is within 10-2T. Results: The MOKE effect can measure a magnetic field intensity up to 100T, with an error 3×10-2T. The Zeeman effect can be measured in a magnetic field intensity of 1~20T. Conclusion: The existential problems of various methods are described. Lastly, some solutions are proposed according to the existential problems, and the development of measurement techniques for strong pulsed magnetic field in the future is prospected. Strong pulsed magnetic field, measurement, electromagnetic induction, magneto-optical effect, magnetic field sensor.